I have had constant back pain for over 2 years now, I figured it was just something I would have to live with because I herniated a disc. So I go see the chiropractor once in a while so it doesn't get too bad but this week when I tried a light Turkish getup and distinctly felt pain on my left side, I realized my spine was not aligned and that was what was causing the residual pain! So I told the chiropractor specifically what hurt, he did an adjustment and my back finally felt normal. The best thing was that it allowed me to bike 3 days in a row! With no back pain or soreness! We did Briar Chapel on Friday night, San lee on Saturday , and then 13.5 miles of 286 on Sunday. All on my singlespeed and all fun! I think we did 35 miles in total. I hope I can continue this way and work on keeping my back aligned properly. And riding the singlespeed was a different feeling than my normal squish bike. 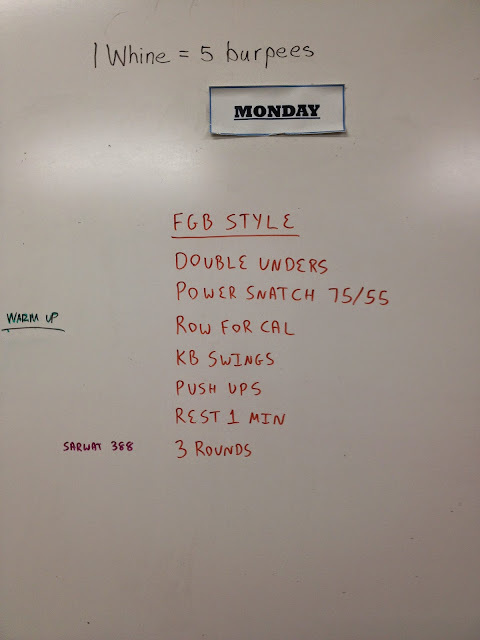 My score was 388, it didn't feel hard like the original Fight Gone Bad WOD but it was good for a Monday! What a weekend! FGB and Mtb!